Aboriginal peoples have Gladue rights under the Criminal Code of Canada, as a result of their unique circumstances in Canada. This means when an Aboriginal person is before the court for a bail hearing or sentencing, the judge must apply Gladue principles and take into account the background factors that may have brought them there. The Aboriginal person can give the court information about themselves and their family history in a Gladue report to help the judge decide the best restorative justice option for them and their community. Our plain language booklet Gladue Report Guide is a new publication to help Gladue report writers. 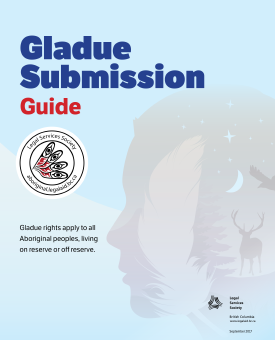 The booklet explains the tasks involved and information required to prepare and write an effective Gladue report to help the Aboriginal person before the court receive fair treatment. The Gladue Report Guide is one of five new LSS Aboriginal publications about Gladue rights and First Nations Court. The others are Your Gladue Rights, Gladue Rights at Bail and Sentencing, Gladue Submission Guide, and What’s First Nations Court? To find out more about Gladue rights, see the Aboriginal Legal Aid in BC website. Rhaea Bailey is the manager of our Indigenous Services department. Earlier this spring she visited the Cknúcwentn First Nations Court in Kamloops. When I walked through the doors of Cknúcwentn I was greeted with the sweet scent of sage. An Elder was smudging anyone who was interested and I took advantage — it creates a feeling of calm and strength within me. Cknúcwentn (Can-nuck-when-tin) is a Secwepemc (Shuswap) word that means the place where help is given. It’s the perfect name for a First Nations court. First Nations courts are sentencing courts. Cknúcwentn was born out of the desire of judges to be able to address the root causes of why people were offending. If you choose to go to a First Nations court you have to plead guilty. The judge, Crown counsel, Elders, and family work with the accused and their lawyer to create a healing plan — a plan to address the root causes of the crime and help the accused, the community, and the victim move on. What I witnessed over the course of the day was restorative justice truly at work. Both the accused and the community had a voice in the courtroom. In fact, the accused was called upon to answer difficult questions and account for their actions, as well as set out their hopes for the future. It was an environment where the accused was given an opportunity to receive advice, which not only included words of warning, but also words of love and encouragement. In a First Nations Court, people are humanized and given an opportunity to do better. I observed firsthand the effectiveness of the court when I watched a blanket ceremony at the end of the day. Two people had turned their lives around and were acknowledged by the whole court when the judge, lawyers, and Elders surrounded the two in a circle and wrapped a beautiful blanket around them while congratulating them on the successful completion of their sentence and healing plans. The pride and accomplishment that radiated from each person touched me, and, at times, I couldn’t hold back my tears. I believe the success of this court is rooted in its cultural approach and the great people involved, as well as the requirement that the accused return each month to report on their progress. First Nations Courts are available in Kamloops, North Vancouver, New Westminster and Duncan. You can learn more on the Aboriginal Law in BC website. Thanks to Indigenous and Northern Affairs Canada for funding towards the printing of this booklet. You can now order the print version of Income Assistance on Reserve in British Columbia and also read it online. We’re happy to share that Clear Skies has won an Apex Award! The Apex Awards is a world-wide competition for publication excellence. Clear Skies is a different approach to talking about the law for us. This graphic novel uses an engaging story and striking imagery to tell the story of Marnie and her kids, who live with family violence. With the support of her community, and by learning her legal options, Marnie leaves an abusive relationship. Clear Skies shows the human side of the legal process. Clear Skies was a joint project with the Healthy Aboriginal Network. It recently won a Communicator Award as well. Congratulations and thanks go out to the entire team that made this project a reality! 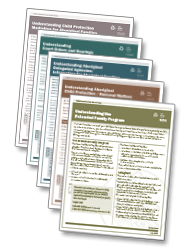 We've reprinted our fact sheet, Understanding the Extended Family Program, with minor revisions. This fact sheet explains in plain language what parents' options are through the Extended Family Program if they're temporarily unable to take care of their children. Under the program, parents can arrange to have family or friends take care of their children instead of putting their children into foster care. We’re looking for feedback from community workers across BC who use our harvesting rights publications, A Guide to Aboriginal Harvesting Rights: Fishing, Hunting, Gathering and Aboriginal Harvesting Rights: If You’ve Been Charged with a Harvesting Offence. We’ve created a short survey to gather your feedback so that we can work to make them better. If you’ve used these publications as part of your work, please take a few minutes to complete the survey here. The survey will be open from August 17 – 31. We’ve revised and reprinted Understanding Child Protection Mediation for Aboriginal Families. This fact sheet has information in plain language about child protection mediation and how it can help Aboriginal families. It also has information on how to find a mediator. A mediator is a professional who’s specially trained to help people reach an agreement and work out conflicts. Mediators are also trained to stay neutral. Aboriginal families can ask for an Aboriginal mediator. The mediator will work with the family to meet their unique needs. Note: Previous editions of this fact sheet are no longer current; please recycle.